The band's third studio album, Follow the Reaper, was their first album to receive a Gold certification in Finland, and subsequent studio albums have acquired the same status. Three consecutive albums debuted at number one on the Finnish album charts, and have also seen chart positions on the United States Billboard 200. The band has incorporated many different musical styles, leading critics and fans to label their work as melodic death metal, power metal. and thrash metal. They are one of Finland's best selling artists of all time with more than 250,000 records sold there alone. With this new line-up, Inearthed proceeded to record their third demo, entitled Shining. This demo did not impress record labels any more than the previous ones had, and none took interest in the band. Despite their efforts, their music got little exposure and managed only to play at local events. As a last resort, the band decided to record an independent, self-funded album. Considering that none of the musicians had much money to begin with, it was an audacious move. Laiho wanted to make use of the keyboards more effectively, but Pirisjoki was not attending rehearsals. Thus, he was fired and replaced by a friend of Raatikainen's, a jazz pianist named Janne "Warman" Wirman. Wirman was the component which was previously missing from Inearthed. His presence allowed the band to assume the style which would later characterize Children of Bodom. With Wirman, the band successfully recorded their first album in 1997. Their debut, Something Wild, was supposed to be released by a small Belgian label, Shiver Records, but second vocalist Sami Tenetz (from Thy Serpent) acquired a copy of their album through the hands of Kuoppala. They both worked for the same company at the time. Shortly after Inearthed signed this contract, Spinefarm Records' boss became interested in signing them for a country-wide release. The latter deal was much more attractive to the band since the Belgian label was offering them close to no help, to the point where they would have to distribute and sell the album themselves. The band was required to create a new name to sign up to Spinefarm Records. The contract with Shiver records had already been signed under the name of Inearthed. The answer to that problem came as the members looked for good names in their local phone book. When they stumbled upon Lake Bodom, they realized that it was a name with impact and one which had an interesting story behind it. A long list of possible names involving the word Bodom was then made, and they settled with Children of Bodom. The band's name is derived from the Lake Bodom murders. Something Wild was produced, recorded and mixed by Anssi Kippo and Children of Bodom at Astia-studios (Lappeenranta, Finland). In an attempt to promote their band, they opened a show for Dimmu Borgir in 1997. Their success was such that a representative from the Nuclear Blast label approached them with a contract for a European release, a deal which started on the subsequent year. Something Wild was released in late 1997 in Finland and in 1998 worldwide. In early 1998, for promotional purposes, the band recorded a music video of the song "Deadnight Warrior". The video was directed by Mika Lindberg and had a slim budget of €1000. It made use of simple scenery, which consisted essentially of an outdoors location after a snowstorm. The band played for a couple of hours at night, with an average temperature of minus fifteen degrees Celsius. Children of Bodom's first European tour began in February 1998. They played with bands such as Hypocrisy (at such festivals as Under the Black Sun), The Kovenant and Agathodaimon, but suffered from the absence of Wirman, who was concentrating on finishing his studies. He was replaced by pianist Erna Siikavirta for the duration of the tour. Months later, the band recorded two new songs again at Astia-studios with producer Anssi Kippo, entitled "Towards Dead End" and "Children of Bodom". The latter was included in a compilation by Spinefarm Records, which after being released remained on the top of Finnish charts for eight consecutive weeks. In late August, the band played the song "Forevermore" live for the first time during a show in Russia. This song was later renamed "Downfall". The second album, Hatebreeder, was recorded between the end of 1998 and the beginning of 1999 by Anssi Kippo at Astia-studios (Lappeenranta, Finland). It was originally entitled Towards Dead End, but while in studio the members of the band opted for the current title. To create anticipation in Finland, the '"Downfall" single was released two weeks prior to the album's release. It was accompanied by a new music video, once more directed by Mika Lindberg. Hatebreeder ultimately topped the charts in many European countries. In July 1999, the success of the "Downfall" single and Hatebreeder allowed Children of Bodom to schedule three concerts in Japan with Sinergy and In Flames. During two of these concerts, the live album Tokyo Warhearts was recorded. In it the band managed to seamlessly reproduce and at times improve on their songs. At their request, no overdubs were used on the recording of the concert. In February 2002, Children of Bodom began writing songs for their upcoming album, entitled Hate Crew Deathroll. They returned to Astia-studio (Lappeenranta, Finland) to work with producer Anssi Kippo again. The session ensued during the months of August and September, and the album was released January 2003 in Finland. It remained on the top of the Finnish charts for a total of three weeks and subsequently became the band's first gold album. Eventually, all of the band's albums reached this status and Follow the Reaper reached platinum. On 3 January 2003, the Finnish Metal Music Awards were held at Tavastia Club in Helsinki. Voting was open to all the metal fans and was presented through the various media outlets that were working with the event's organizers. Children of Bodom was awarded Finnish Band of the Year. Children of Bodom's first world tour began in 2003 and lasted until late 2004. The tour had many sold-out concerts and marked the consolidation of the band in North America, but was also accompanied by an unexpected announcement: Kuoppala decided to quit Children of Bodom for personal reasons right in the middle of the tour without giving previous warning. In an interview, when Laiho was asked why Kuoppala left the band, he stated that "Well, I try to be careful about what I say about him because there is no bad blood between us. He told me that he just got sick of touring and the whole band/rock 'n roll lifestyle living in hotels and tour buses and stuff. For me it was really weird because he was always the one who was SO into it! He was a die hard rock 'n roller and suddenly he made a quick 180 turn in his whole life. This whole situation involves a new girlfriend." Griffin's guitarist Kai Nergaard was invited by Laiho to replace Kuoppala, but did not accept the offer. Thus, Alexi's bandmate from Sinergy, Roope Latvala (founding member of Stone, one of the bands which started the heavy metal movement in Finland) assumed the guitars as a session player, until a more permanent solution could be found. This formation was introduced in Moscow on 16 August. On 31 March 2007, the band's website released information on Laiho's condition stating that while Laiho's injury will never fully heal, it no longer affects his ability to play the guitar. The same notice also stated that the band had already written some songs for a new album and would start recording sometime later in 2007. From October to December 2007, Children of Bodom recorded their sixth studio album, entitled Blooddrunk, which was released on 15 April 2008. The album contained 10 songs including a cover of "Ghost Riders in the Sky". Children of Bodom was featured on the Gigantour 2008 North American tour with Megadeth, In Flames, Job for a Cowboy and High on Fire. 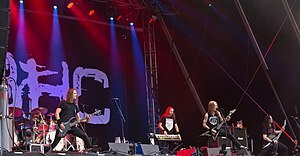 Children of Bodom was one of the first bands to be confirmed for Wacken Open Air 2008, where they performed alongside many bands including Iron Maiden, Sonata Arctica and Avantasia. Children of Bodom played at Donington Download on 15 June, playing a mixture of old and new songs. On 8 March 2008, Children of Bodom did their first UK signing event at the Zavvi music shop in Oxford Street, London. They signed copies of their new single "Blooddrunk" in CD, 7 inch and 12 inch vinyls, only 666 copies of the 12 inch vinyls have been made. On 26 June 2008, Children of Bodom played their first show in Auckland, New Zealand with support from local scene acts Dawn of Azazel and Subtract at the Transmission Room. In 2008, Children of Bodom's first three studio albums, as well as Tokyo Warhearts, were remastered and re-released with bonus tracks. In September and October 2008, the band toured the U.S. supporting Blooddrunk with support from The Black Dahlia Murder and Between the Buried and Me. Testament also made a special guest appearance in the main support slot at the tour's New York City date. In November and December 2008, the band toured in Europe supporting Slipknot and Machine Head. From late January to early March 2009, the band also co-headlined the European tour with Cannibal Corpse with Diablo opening for them. On 2 April 2009, Children of Bodom embarked on the No Fear Energy Tour headlined by Lamb of God with main support from As I Lay Dying and themselves, and rotating opening slots with God Forbid and Municipal Waste, but dropped off the tour a week before it was finished following a serious injury Alexi suffered after falling from the top bunk of his tour bus on 26 April 2009, after the show in Palladium Ballroom, Dallas, Texas. In addition to the injury, on 8 May 2009, at Roseland Ballroom in New York City, Alexi and Children of Bodom were forced to quit playing after a few of their songs because of Alexi's previous injury. Laiho originally planned to continue touring despite his injury but was forced to cancel last six dates when any efforts to alleviate the pain failed. All summer festival dates went down as planned and were unaffected by Alexi's injury. In February 2009, Children of Bodom hinted at plans to release a cover album entitled Skeletons in the Closet, which was released on 23 September 2009. They also admitted to being "lazy" when it comes to practicing and talked about plans to have more songs on future albums. The band embarked on a tour of South America and Mexico in September 2009. Support for the trek came from Amorphis. Also in September and October 2009, the band returned to North America to headline a massive month-long tour. On most dates support on the trek came from The Black Dahlia Murder and Skeletonwitch. Austrian Death Machine and Holy Grail made a special guest appearance in the main support slot at the tour's second Pomona, California date. On October 18, 2009, four days after the band's North American tour finale in Honolulu, Hawaii they performed at Japan's Loudpark Festival along with Megadeth, Judas Priest, Slayer, Anthrax, Rob Zombie and Arch Enemy. In the six days following their performance at the Loudpark Festival, they held three shows in Hong Kong, Taiwan and China respectively. They finished their two-month September to October tour in Moscow, Russia. This concluded their year and a half long Blooddrunk World Tour. After the Blooddrunk tour ended, Children of Bodom started recording their new album. During the recording of the drum tracks there was a small tornado and the power was cut out. Consequently, the recording was delayed until after their tour with Black Label Society. Children of Bodom released some information to Metal Hammer magazine about new album tracks. The three track names they released were entitled: "Pussyfoot Miss Suicide", "Ugly", and "Was It Worth It?" In November the band announced "The Ugly World Tour 2011" which would run from March–May 2011 and would feature dates around Europe. Opening Acts were Ensiferum, Machinae Supremacy and Amon Amarth (UK only). On 24 November, it was announced that the title of the album would be Relentless Reckless Forever. The album was released on 8 March 2011. A music video for "Was It Worth It?" was produced, featuring skateboarder Chris Cole as well as noted pro skaters Jamie Thomas, Garrett Hill and Tom Asta. "Was It Worth It?" was released as a downloadable track for Guitar Hero: Warriors of Rock on 2 February 2011 for European PlayStation 3 owners, and 8 February 2011 for Xbox 360 and Nintendo Wii worldwide, as well as non-European PlayStation 3 owners. Music journalist Neil Kelly of PopMatters said in praise of the album, "Death metal could very well re-enter mainstream consciousness through Halo of Blood, the most accessible Children of Bodom release yet." In May 2014, the band toured eastern Australia, visiting Brisbane, Sydney and Melbourne with Eye of the Enemy as support, along with Orpheus Omega in Melbourne, and Emergency Gate in Brisbane and Sydney. On 7 April 2015, the band announced that they have begun working on the follow-up of Halo of Blood. On 29 May 2015, the band announced on their Facebook page that Roope Latvala is no longer part of Children of Bodom with the new album to be recorded as a four-piece for the first time. However, the band later updated that Latvala's part in the band will be filled in by Antti Wirman, keyboardist Janne Wirman's younger brother for live commitments until the end of the year; he debuted with the band in a private live show in Helsinki. In a later interview with Wirman, he stated that his brother would not join the band permanently. On 8 June 2015, the album title was announced as I Worship Chaos and was released through Nuclear Blast on 2 October 2015. On 19 January 2016, the band announced the addition of Daniel Freyberg on guitar. He would make his live debut with them in Tampa, Florida on 9 February. In an interview with Noizr Zine, taken on September 14, 2017, Children of Bodom's keyboardist Janne Wirman answering to the question about the band's plans to start working on a new album with "the same production team" (Mikko Karmila and Mika Jussila) after '20 Years Down & Dirty' tour ends, said the following: "Yes, I think we are. And we’re going to record it in our warehouse." In November 2017, Bassist Henkka Seppälä discussed in an interview that the band have half an album's worth of material written for the next album. They began to start recording the new album in March 2018. In August 2018, Seppälä stated in an interview with TotalRock Radio that the album will be released in early 2019. In November 2018 the band revealed that the next album will be called Hexed and will be released on 8 March 2019. ^ "Discography Children of Bodom" (in Finnish). Finnish charts. Retrieved 24 May 2009. ^ "Metal from Finland: Children Of Bodom". Metalfromfinland.com. Archived from the original on 1 May 2008. Retrieved 22 July 2011. ^ Stagno, Mike (28 November 2006). "Children of Bodom – Follow the Reaper". Sputnik Music. Retrieved 10 January 2017. ^ Ankeny, Jason. "Children of Bodom". Allmusic. Retrieved 6 November 2011. ^ "Metalstorm.ee: Children of Bodom biography". Metalstorm.ee. Retrieved 17 June 2017. ^ a b "CoC : Children of Bodom : Interview : 1/16/1999". Chroniclesofchaos.com. Retrieved 6 November 2011. ^ "Children of Bodom FAQs". COBHC.com. Archived from the original on 4 July 2013. ^ "Metal News - Finnish Metal Music Awards 2003 Results ( Metal Underground . com )". Metalunderground.com. Retrieved 22 July 2011. ^ "Interview with Children of Bodom's Alexi Laiho". Metal-Rules.com. Retrieved 22 July 2011. ^ "Children of Bodom Hate Crew Official Website | The Ugly World Tour 2011". Cobhc.com. Retrieved 22 July 2011. ^ "Metal News - Children of Bodom Reveal American Release Date ( Metal Underground . com )". Metalunderground.com. Retrieved 22 July 2011. ^ "Gigantour 2008 lineup". Roadrunnerrecords.com. Retrieved 22 July 2011. ^ "Billing/Bands 2008". Wacken Open Air. Archived from the original on 27 September 2007. Retrieved 3 December 2007. ^ "Children of Bodom Hate Crew - Official Website". Cobhc.com. Archived from the original on 1 January 2011. Retrieved 22 July 2011. ^ "Blabbermouth.Net - Lamb of God, As I Lay Dying, Children of Bodom To Team Up For North American Tour". Roadrunnerrecords.com. Archived from the original on 21 February 2009. Retrieved 26 July 2010. ^ "CHILDREN OF BODOM Performs Abbreviated Set in New York City". Roadrunnerrecords.com. Archived from the original on 13 May 2009. Retrieved 26 July 2010. ^ "Children of Bodom To Release 'Skeletons in the Closet' Collection of Covers". Blabbermouth.net. 23 April 2009. Archived from the original on 1 April 2012. Retrieved 23 April 2009. ^ "Children of Bodom Talk Cover Albums!". Female First. 23 February 2009. Retrieved 26 July 2010. ^ "CHILDREN OF BODOM Bassist Checks in From The Road". Roadrunnerrecords.com. Archived from the original on 1 February 2013. Retrieved 26 July 2010. ^ "Children of Bodom Hate Crew Official Website". www.cobhc.com. Archived from the original on 21 February 2009. Retrieved 26 July 2010. ^ "CHILDREN OF BODOM New Song titles Revealed". Jorzine.com. Archived from the original on 13 July 2011. Retrieved 6 November 2011. ^ "Children of Bodom Hate Crew Official Website". www.cobhc.com. Archived from the original on 20 November 2010. Retrieved 26 July 2010. ^ "CHILDREN OF BODOM: 'Was It Worth It?' Video Released - Feb. 15, 2011". Roadrunnerrecords.com. Archived from the original on 19 February 2011. Retrieved 22 July 2011. ^ Kelly, Neil (19 June 2013). "Children of Bodom: Halo of Blood". PopMatters. ^ "Halo of Blood Over Australia Tour 2014 at The Hi-Fi Sydney (Moore Park) on 9 May 2014 –". Last.fm. 9 May 2014. Retrieved 27 October 2015. ^ "Children of Bodom Begin Work on New Album | Music News @". Ultimate-guitar.com. 5 April 2015. Retrieved 27 October 2015. ^ Vallecillo, Alix. "Children of Bodom part ways with guitarist". Metal Insider. Retrieved 30 May 2015. ^ "Interview: Janne Wirman from Children Of Bodom". Moshville. Retrieved 20 August 2015. ^ "Children of Bodom Recruit New Guitarist". http://veniamagazine.se/. 21 January 2016. Retrieved 30 May 2016. ^ Noizr Official Youtube channel. "Interview: CHILDREN OF BODOM's Janne Wirman on Touring, New Album, and "Stranger Things" — Noizr". Retrieved 2017-09-29. ^ TotalRock Radio Official Youtube channel. "Children of Bodom interview Wacken 2018 — TotalRock Radio". Retrieved 2018-08-20. Wikimedia Commons has media related to Children of Bodom.